Click on the logo above to access my entry on the MO website. The embargoed boxes (numbered 21 to 30) contain material which, with a couple of small exceptions, will enter the public domain in 2038. Diaries and personal letters have a cut-off date of 1975, the year I set off to go round the world. Those after that date my bachelor days came to an end, and it therefore seemed appropriate to embargo for a reasonable period. This leaves quite a lot of personal correspondence before 1975 which some might say should also be embargoed. There is also the question as to whether a thirty-year embargo (I reckoned from 2008) is sufficient. I don’t think there are easy answers on this subject. Some maintain that material written for a private readership should never be published. That was the decision of my father and aunt when they sorted through my paternal grandfather’s papers following his death in 1937. It was also Sigmund Freud’s decision about the personal papers of his youth; he commented to his wife-to-be that he wished to make life difficult for his biographers! The well-worn phrase ‘a rapidly changing society’ is undoubtedly a valid description of our present condition. My own ‘all over the place’ feeling, or some variation on it, is very common, and in these circumstances people sense a need to make connections with their past. Hence the rapid expansion of family history research and the fascination with what are regarded as the certainties of war (we’re right, they’re wrong). In times which moved more slowly, you might have been satisfied with knowing something about your grandparents and great grandparents. Nowadays the earlier parts of our own lives are clearly part of history. When we visit a museum we are likely to see tools, instruments, modes of transport, telecommunication equipment, copying machines, cameras and so on which were familiar to us as children and teenagers but are now completely obsolete. Likewise I saw around me at Featherstone Castle, when I was growing up, the relics of an earlier technological age: gas lamps, hot irons, a horse trap, a magic lanterns with hundreds of glass slides (where did they go? ), three-dimensional viewers of First World War scenes, not to mention our under-maintained railways. I longed to know more about the lives of people who used these things. History, then, is getting ever closer to us, and consequently we become increasingly interested in documents which relate to an ever more recent past. In judging what to reveal to the public, therefore, I have been inclined to open documents to public scrutiny rather than hide them. It would clearly still be wrong, however, include in the open boxes (and this applies equally to this website) material which could be seriously hurtful or even harmful to people who are still alive. My thirty-year rule may or may not be a reasonable compromise. It’s the best I could come up with so far. (7) Miscellaneous post-1967. Includes a note re non-inclusion of DPhil documents to date. (a) Inflation and Public Opinion, a doctoral dissertation by Elsie Kanin originally presented in Königsberg, 1929, translated 1998. (b) A Grandfather Remembers, the memoirs of Rabbi Caesar Seligmann, translated from the manuscript and edited, 2004. (c) Memories from Nine Decades, Erwin Seligmann. 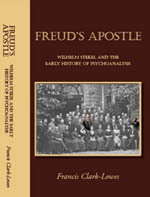 (2) Announcement of Publication of Freud’s Apostle: Wilhelm Stekel and the Early History of Psychoanalysis, 2011 (DPhil dissertation, 1999, with new Foreword), Authors onLine. Box 17. Other activities / interests. (7) Correspondence not included elsewhere. (8) Jews, the holocaust, Jewish Film Festival etc. There are ten further embargoed boxes.